Microsoft says its next generation video game console is backed by a half-billion dollar ad campaign and packs in technology ripped from the fantasy world of Minority Report. It's also already sitting in more than 40 million living rooms. It's not a new version of Microsoft's Xbox, but the five-year-old Xbox 360 paired with an all-new camera the Redmond giant has dubbed Kinect. Kinect eliminates the need for players to hold video game controllers, using a sophisticated camera system that detects players' movements and their voices. "You are the controller," ads boast. Is This Kinect Ad More To Your Liking? With Kinect, players can dance, run or shadow box in front of their console, seeing their motions recreated on screen. They can drive race cars by miming a steering wheel or work out with a virtual trainer. They can virtually pet tiger cubs, leopards and panthers. The motion-sensing device lets players control their TV screens with swipes of the hand and voice commands, bringing the fantastical kinetic interface of Steven Spielberg's Minority Report closer to reality. Kinect makes the Xbox 360 a cool competitor to other devices fighting for control of your TV, namely Google TV and Apple TV, from Microsoft's biggest rivals. The people who make Windows want to block the people who make iPods and search engines from gaining a foothold near your TV by dazzling you with a new way to interact with it. The company also hopes to capture a new audience, following in the footsteps of the current market leader, Nintendo, whose Wii console has sold more than 74 million units. The $150 add-on, which combines off-the-shelf tech with the efforts of an army of Microsoft software engineers, launches in North America next week, globally by the end of November. Microsoft has already begun promoting the device with the help of Oprah, Ellen, Disney and Nickelodeon. Estimates put Kinect's ad budget at more than $500 million dollars. Expect nothing less than total saturation by Christmas. Can Microsoft breathe new life into its aging Xbox console with an all-new control scheme? Let's look. Kinect comes in the form of a squat, glossy black rectangular camera that sits in front of a television. Plug it into a port on the Xbox 360—it's designed to work any model of the game console—and Kinect starts to see. Its set of eyes scans a room, detects the shape of players, and tracks the movements of their arms, legs and head. An array of microphones, Kinect's ears, listen for instructions. Players can speak out orders to play movies, pause and play games, or make video calls with friends who are also Kinect owners. Kinect needs room to breathe, working better in open spaces without objects like furniture and pets distracting the sensor. Ideally, Microsoft says, the device needs a good six feet of space and a clean floor to operate. That could be a problem for apartment dwellers or players who want to use Kinect outside of their living rooms. For a "next-generation entertainment" experience, those technical limitations ground it in the present. Some of Kinect's first game experiences also feel less futuristic than they do already played out. Microsoft's first batch of Kinect titles is a colorful collection of energetic, activity-based games, each controlled with broad-sweeping gestures and full body movement. Most are controlled standing up, because players' bodies aren't as easy to detect when seated on a couch. Kinect's game offerings so far closely match some of the biggest successes for Nintendo's Wii platform. Kinect Sports, for example, is Microsoft's take on Wii Sports, the best-selling game of all time. Players can box, kick a virtual soccer ball or bowl with their avatar likeness on-screen. 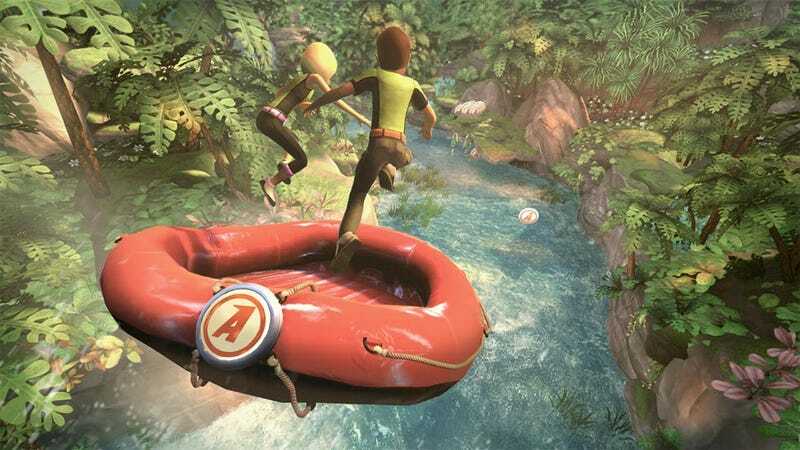 Kinect Adventures, which the company has demoed on Late Night with Jimmy Fallon and The Home Shopping Network, is another collection of rapid-fire activities like rafting and dodgeball. The fuzzy, kid-friendly Kinectimals is a virtual pet game, letting players train tigers or play hide and seek with a cheetah, all without the fear of claw marks. Microsoft also has physical fitness games, dancing games, and games that are designed to stimulate players' brains coming to Kinect, thanks to the efforts of third-party game makers. Those new genres spawned success for Nintendo on the Wii. Microsoft has seen criticism from gamers about its line-up of Kinect games, which have been labeled "Wii clones" and "gimmicky." Don&apos;t These Kinect Games Sound Awfully Familiar? Perhaps the most promising of those Kinect games is a dancing game—part exercise tool, part virtual dance instructor—from the people behind Guitar Hero and Rock Band. Launching the same day as Kinect, Dance Central designed to teach gamers how to dance to pop and hip-hop songs. Even resistant gamers have championed Dance Central as a potential "killer app" for the camera controller. In all, 17 games will launch alongside the add-on and shortly thereafter. Microsoft and its partners have announced a handful of games that are unlike anything else players can get on the Wii, including a dragon riding game called Project D and a game that puts players in control of massive war machines, Capcom's Steel Battalion: Heavy Armor. Those games and others announced at this year's Tokyo Game Show may help persuade Xbox 360 owners used to playing Halo, Fable, Forza and Gears of War games, that Kinect is more than just a sophisticated gimmick. The Xbox 360 may be considered first and foremost a video game console, but Microsoft has slowly been adding apps like Facebook, Twitter, Netflix and more to the console, transforming it into the long-elusive "set-top box." The arrival of Kinect will also bring new additions like ESPN and an expanded Zune store, from which Xbox 360 owners can download movies, TV shows, and music. Interacting with those functions can be performed with the wave of a hand. If the obstacle for players wanting to do more with their Xboxes is a video game controller, Microsoft hopes Kinect's voice and gesture commands will offer a new way to interact. Kinect also lets Xbox 360 owners call up people from around the world, whether they're Kinect owners or on Windows Messenger on their PC. Microsoft showed off that tech at this year's E3 expo with a slightly awkward demonstration of one of its most mainstream applications. In the immediate future, the Xbox 360's game line-up will see a dramatic change. The Halos and Gears of Wars that dominate the platform will feel pushed aside for more inclusive games that are less about bullets and bombs, more about family-friendly action. While those games are still a big part of the Xbox 360's success, with new iterations of Halo and Fable having just arrived in time for the holidays, Microsoft is broadening its horizons. That's something the company has tried before with limited success in the form of games like farming sim Viva Pinata, goofy movie maker You're In The Movies, and karaoke game Lips. But those games were half-steps compared to Kinect's leap. Halo: Reach isn&apos;t the beginning, it&apos;s the end. The Xbox 360 maker is blowing hundreds of millions on promoting Kinect, but it won't catch on unless it also spends heavily on creating games for the add-on and caters to game developers, convincing them that the controller will be a success. Microsoft will update the look and feel of the Xbox 360's interface once again this fall, a change timed with Kinect's arrival. That update introduces Kinect control for the system's dashboard so you can browse your Netflix movie library with a flick of the wrist or play, pause, fast-forward music and TV shows with your voice. If Kinect finds success on the Xbox, Microsoft may bring the tech to personal computers and other electronic devices, all but eliminating the physical remote control. And if Kinect lives up to its promise, will we still be impressed by the computers of the future that can only do this? Stay tuned for our ongoing original coverage of Kinect, including reviews of launch games and hardware, hitting next week.